When I was a young geologist (back when “Tertiary” was a valid name for part of the geologic time scale), we couldn’t actually watch the plates move. We accepted that they moved, but all the evidence was indirect. Weird magnetic stripes on the ocean floor. Rock magnetization that suggested that the North Pole had moved... but different directions in different places. Offset stream beds, or alluvial fans, or volcanoes. Now, however, we have GPS. We can find where we parked our trucks We can measure the locations of points on the Earth’s surface over and over again... and we can watch them move. Isn’t it cool when science turns out to be right? Except... well, if you look at the data really closely, at scales smaller than plates, the geology and the GPS don’t exactly match up. 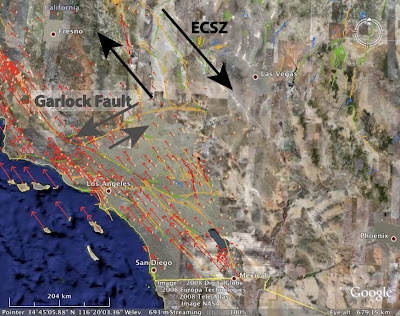 Look at the faults in southern California, for instance. There’s this big, obvious Garlock Fault... and the GPS tells a totally different story. The Garlock Fault shows up nicely on the map (and on the topography). But the GPS measurements show the importance of another feature, the Eastern California Shear Zone (ECSZ) (which is related to another feature, the Walker Lane, which shows up in GPS measurements on the western edge of the Basin & Range). There’s also a problem if you look at the rates of movement along faults in Los Angeles. And if you’re a Californian, and you want to know how likely the Big One is, you might wonder who, exactly, to believe. There was a GSA session that dealt with that problem. And it turns out that there are a number of ways to resolve the disagreements. On a human time scale, the absolute rates probably don’t make as much difference as human behavior. (Especially if you’re in southern California. Participate in Shake Out regardless of the slip rates.) But as a scientist, it’s satisfying to see conundrums resolved satisfactorily. Meanwhile, in a session this morning, Mark Dyson (along with Sarah Titus, Charles DeMets, and Basil Tikoff) had a nice example of a case in which the GPS data, geologic maps, and mechanical modeling told the same story. It’s nice when the science works. *Eric also had one of the best lines I've heard at the conference: he studies strike-slip faults because normal faults and thrust faults "eat their young" - they create topography, which leads to erosion, which leads to loss of part of the story. I love it. Edit: Eric told me that he got that line from Ramon Arrowsmith. It's still a great line, but credit where credit is due, and all that. Ooooh. I like that "eat their young" bit. Great post, and it sounds like a great GSA meeting. I think you can actually go watch a thrust "eating" away on the east end of the Garlock Fault, where the Avawatz Range orverides its own talus.